JEFFERSON CITY, Mo. — Missouri’s Republican Governor Eric R. Greitens is stepping down from office amidst multiple investigations concerning sexual misconduct and campaign finance violations, though he maintains his innocence. The second-year governor on Tuesday announced that he would leave office effective Friday, June 1, elevating current Lt. Gov. Mike Parson to the vacant seat. It’s a surprising move from the fiery Republican, a former Navy SEAL who had a meteoric rise to the state’s top executive position. The Governor resigned the same day a Cole County judge ruled in favor of the House for more information from the Governor’s political committees. Greitens maintained innocence, saying he has not broken any laws. “I cannot allow those forces to continue to cause pain and difficulty to the people that I love. I know and people of good faith know that I am not perfect,” Greitens continued. “But I have not broken any laws, nor committed any offense worthy of this treatment. I will let the fairness of this process be judged by history. It has been a great honor and a privilege to serve as your governor. Travelling the state I have talked to many of you who harbor extraordinary anger at this ordeal and for those who have pushed and promoted it. Beetem’s order concerned the House’s request for documents related to the ongoing work of the investigative committee that was tasked with determining whether to bring articles of impeachment forward against Greitens. That decision, it seems, proved to be one of the final straw in Greitens’ decision to step down. Greitens first hit the political realm when he announced his campaign in 2015, where he reached voters on his platform as a conservative outsider seeking to clean up corruption in Missouri. A native St. Louisan, Greitens had studied abroad as a Rhodes scholar before joining the Navy SEALS, where he served and won a Bronze Star and Purple Heart. After leaving the military, Greitens began a nonprofit dedicated to veterans’ issues. He became a motivational speaker and author, penning three books, and even earned a spot on Time magazine’s 2013 “100 Most Influential People” list. It was a stellar resume for someone looking to enter politics, and though he had been a lifelong Democrat, he announced his intent to run as a Republican, touting his resume and reputation as a family man and outsider. After securing victory in the Republican primary amidst a field of candidates with household names, Greitens managed to overcome Democratic candidate Chris Koster in a sweeping red victory in November of 2016. 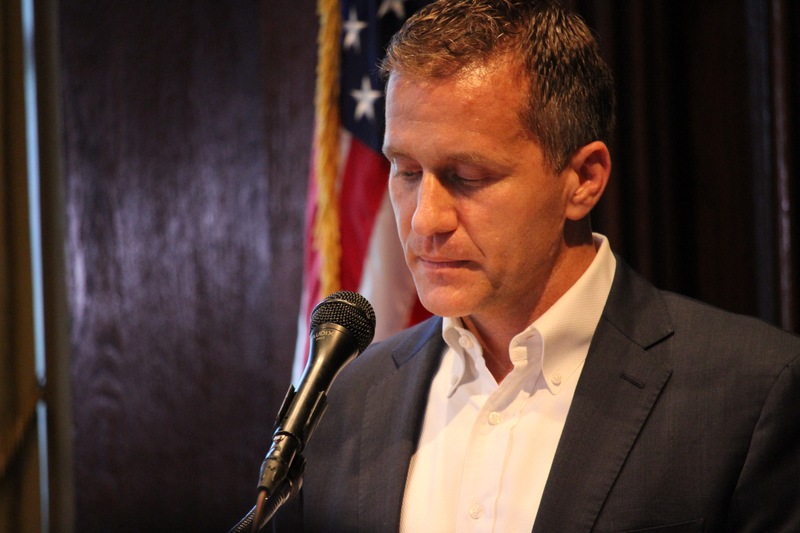 Upon entering the office of Governor, Greitens quickly looked to deliver on several of his campaign promises, one of the first of which was implementing a ban on lobbyist gifts in the office. He then set his sights on pushing numerous changes to the state’s rules and laws, in an effort to create a better business environment. He helped push legislation passing right-to-work across the finish line, signing the bill while the legislative session was still underway. He also pushed forward for change to the state’s legal environment, including the passage of the Daubert standard. He continued advocating for law enforcement, and was visible when protests erupted once again in St. Louis following the Stockley verdict. It seemed that Greitens had been destined for an upward trajectory, with a successful first year in the bag. But delivering his second State of the State address proved to be the turning point. After delivering the speech, news broke later that night when it was reported that he had engaged in an extramarital affair in 2015. The ex-husband of Greitens’ former mistress recorded audio of the woman describing how Greitens photographed her in a compromising manner and threatened to use the photo as blackmail. “You’re never going to mention my name, otherwise this picture will be everywhere,” she quoted him as saying on the tape. Following the news, Greitens admitted to the affair, calling it a mistake, but insisted that it had been a consensual relationship, and that he had never blackmailed the woman nor threatened to do so. Greitens was indicted for felony invasion of privacy relating to the woman with whom he had an affair, but those charges have since been dismissed. He is still facing a charge for felony computer tampering. Greitens is accused of taking a fundraising list from The Mission Continues — the charity he helped start — without the organization’s permission, and using that information to raise money for his 2016 gubernatorial campaign. Following Greitens’ announcement, Jean Peters Baker, the Cole County prosecutor who was appointed as a special prosecutor in the invasion of privacy case, said her investigation into the now former governor would continue. Following the Governor’s announcement, House leadership issued a statement saying that they stand ready to help ensure a smooth transition from Greitens to Parson, and thanking the special investigative committee for its work. “We believe the Governor has put the best interest of Missourians first today by choosing to resign. The past few months have been difficult for everyone involved, including the Governor and his family. This is a serious and solemn occasion that reminds us that our state and our duty are bigger than any one person or party. The House stands ready to help ensure a smooth transition of power to Governor Parson. The hallmark of democracy is that our public service is temporary. Missouri has been blessed with an unbroken line of men and women in public service who have worked to make our state better, and the work of the many dedicated public servants, who work tirelessly for the people of Missouri, will continue. The responsibility the House undertook with its investigation is not a path any of us would have chosen, but it is one we were obligated to pursue in an effort to do what is best for our state. We want to thank the members of the Special Investigative Committee on Oversight for the serious and professional manner in which they went about their task. We also want to thank the staff for the countless hours and sacrifices they made. Attorney General Josh Hawley also applauded the Governor’s resignation. “The House stands ready to help ensure a smooth transition of power to Governor Parson. The hallmark of democracy is that our public service is temporary. Missouri has been blessed with an unbroken line of men and women in public service who have worked to make our state better, and the work of the many dedicated public servants, who work tirelessly for the people of Missouri, will continue. “The responsibility the House undertook with its investigation is not a path any of us would have chosen, but it is one we were obligated to pursue in an effort to do what is best for our state. We want to thank the members of the Special Investigative Committee on Oversight for the serious and professional manner in which they went about their task. We also want to thank the staff for the countless hours and sacrifices they made. “Innocent people don’t resign and criminals don’t get let off the hook simply because they cut and run. Missourians deserve to know what laws were broken, what lies were told, and how deep the corruption went,” said Walsh. St. Louis Mayor Lyda Krewson reacted to the announcement of resignation on Twitter. Both U.S. Senator Roy Blunt, Treasurer Eric Schmitt and former Gov. Matt Blunt called for unity after the turbulent time and lent their assistance with the transition of incoming-Gov. Mike Parson. “The governor made the best decision for his family and the state,” U.S. Sen. Blunt said. “I look forward to to Gov. Parson’s leadership and will do everything I can to be helpful.” Roy Blunt.